Sonam Kapoor dancing without a care in the world to Jimmy Jimmy Aaja from 1982 film Disco Dancer proves she a true blue Bollywoodwallah. 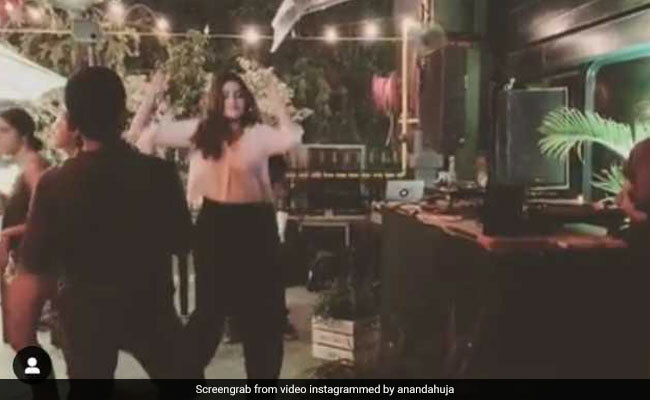 The actress is currently in New Delhi with her husband Anand Ahuja, who posted a video of his wife dancing to the retro track at a club in the city. Sonam, dressed in monochrome separates, danced like no one's watching with designer Nimish Shah (of label Shift), who frequently collaborates with Bhane, the fashion label owned by Anand Ahuja. For Anand Ahuja, who skipped the dance part of the night, Sonam wrote: "Next time you also have to dance with us." Here's a picture from last night posted by Sonam, in which she and Anand pose with Nimish Shah and Anand's brother Anant Ahuja. "A Team - Anand Ahuja, Nimish Shah and Anant Ahuja. #bhaane #ahujas+nimsha #madstarbase #wildcity," she captioned the post. It appears that they're working on a new collaboration project. Sonam Kapoor frequently shuttles between Delhi, London and Mumbai. She is currently filming The Zoya Factor, based on Anuja Chauhan's 2008 novel of the same name. Actor Dulquer Salmaan has been cast opposite Sonam in the film, directed by Abhishek Sharma. Sonam Kapoor is best-known for her roles in films such as Raanjhanaa, Delhi 6, Neerja, PadMan and Dolly Ki Doli. She was last seen in Ek Ladki Ko Dekha Toh Aisa Laga, in which she co-starred with her father Anil Kapoor for the first time.